The next meeting for the Workplace Health Promotion Network (WHPN) in Brisbane will be on Thursday 18th September 2014, from 10am-1pm. 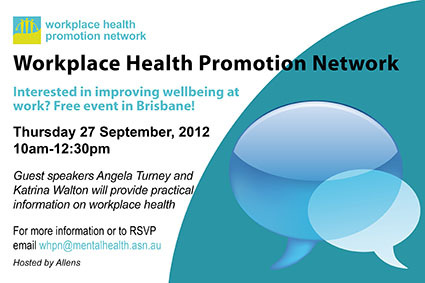 The next meeting for the Workplace Health Promotion Network (WHPN) in Brisbane is on Tuesday 29th April 2014, from 10am-1pm. Guest speakers include Jorgen Gullestrup from Mates in Construction NSW, William Smith-Stubbs from Spur Projects and Alison Hill from Pragmatic Thinking. The meeting will be hosted by the National Safety Council of Australia. The first meeting of the Workplace Health Promotion Network (WHPN) in 2014 will be in Brisbane on Monday 24th February 2014, 10am-1pm. It will be hosted by Brisbane City Council in Brisbane Square, Level 16, 266 George St, Brisbane CBD. Matthew Bannan from WorkCover Queensland will provide an update on the changes in the Workers Compensation and Rehabilitation and other Legislation Amendment Bill 2013. Catherine Gillespie from Workplace Conflict Resolution will present about conflict in the workplace, tips to remedy current conflicts and suggestions for protection measures to put in place. The next meeting for the Workplace Health Promotion Network in Brisbane will be hosted by Queensland Aboriginal and Islander Health Council (QAIHC) at the 21 Buchanan St, West End, Queensland 4101,from 10am to 1pm on Thursday 31st October, 2013. The next meeting for the Workplace Health Promotion Network in Brisbane will be hosted by Allens law firm from 10am to 12.30pm on Thursday 20 June. We are pleased to announce our expert guest speakers are from three different teams within Workplace Health and Safety Queensland (WHSQ). Professor Philip Bohle will be speaking about psychosocial factors and work organisation, including working hours and stress factors in the workplace. Find out more about the event or sign up for a Starter Membership Pack to attend your first meeting in Brisbane. The Workplace Health Promotion Network (WHPN) is commencing members only meetings for the first time in 2013. Events are a great networking and professional development opportunity, don’t miss out, RSVP today!